We are going to develop a simple Matlab GUI. We’ll use the Matlab GUIDE (Graphical User Interface Development Environment) which is pretty handy... This article is a super-fast introduction, but very convenient because with some ingenuity you can learn it in 10 minutes... or so. This will open the ‘Quick Start’ window, where you can study or review their examples, too! For the moment, please follow me and select the fist option: ‘Blank GUI (Default)’. Then, an untitled figure will pop-up. You have some components on the left menu, which you can drag onto your interface. 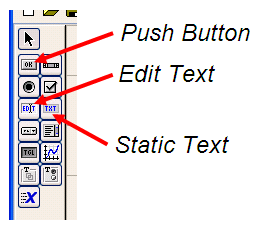 In this example we are going to use only two ‘push buttons’ and one ‘static text’. Drag and drop a ‘static text’ onto your Matlab GUI. You can reduce or increase the size of your interface window by dragging its bottom-right corner, as it’s done in other drawing programs. Double click on this ‘static text’ and a ‘Property Inspector’ window will appear. Scroll down and look for the ‘String’ property and delete what's in there. For the moment we want it to be blank. Then, drag-and-drop a ‘push button’ onto your interface. Modify its ‘String’ property to read ‘Launch Message’. Let its ‘Tag’ property intact. You could change this tag... it’s the name or identifier of the object as it’s going to be recognized in the rest of the code. Drag-and-drop another ‘push button’. Modify its ‘String’ property to read ‘Clear Message’ and leave its ‘Tag’ as it is. You’ll produce these results. You’ll be asked to save your figure. A good name (only my suggestion) is hello_world.fig... use the name that you like. You’ll be taken to the Matlab code (in the editor window) that will drive your interface. Matlab has automatically created functions related to your components. You have to make the final touches... For the moment, don’t worry about the many lines automatically created. Just focus on what we need to do. The ‘Callback’ functions are the instructions that will be executed when the user pushes the buttons or does something with the components that you have included in your Matlab GUI. In this case, you’ll see something like this code. The first parameter is the object (component) that you’re going to modify. It starts with ‘handles.’. The second argument is the object’s property that you’re going to modify, and in this case is the ‘String’ property. The third argument is the value that you want to assign to the property. The result is that when the user presses the ‘Clear Message’ button, a blank message will appear in the ‘output line’ (officialy named ‘handles.output_line’). and... presto! a ‘hello_world’ window has appeared! It’s your first Matlab GUI! You can drag-and-drop your components onto your graphic interface to start your Matlab GUI. Matlab will automatically create callback-functions, related to the buttons or other components that you include.